Put simply, Principia Qualia (click for full version) is a blueprint for building a new Science of Qualia. PQ begins by considering a rather modest question: what is emotional valence? What makes some things feel better than others? This sounds like the sort of clear-cut puzzle affective neuroscience should be able to solve, yet all existing answers to this question are incoherent or circular. Giulio Tononi’s Integrated Information Theory (IIT) is an example of the kind of quantitative theory which could in theory address valence in a principled way, but unfortunately the current version of IIT is both flawed and incomplete. I offer a framework to resolve generalize IIT by distilling the problem of consciousness into eight discrete & modular sub-problems (of which IIT directly addresses five). Finally, I return to valence, and offer a crisp, falsifiable hypothesis as to what it is in terms of something like IIT’s output, and discuss novel implications for neuroscience. 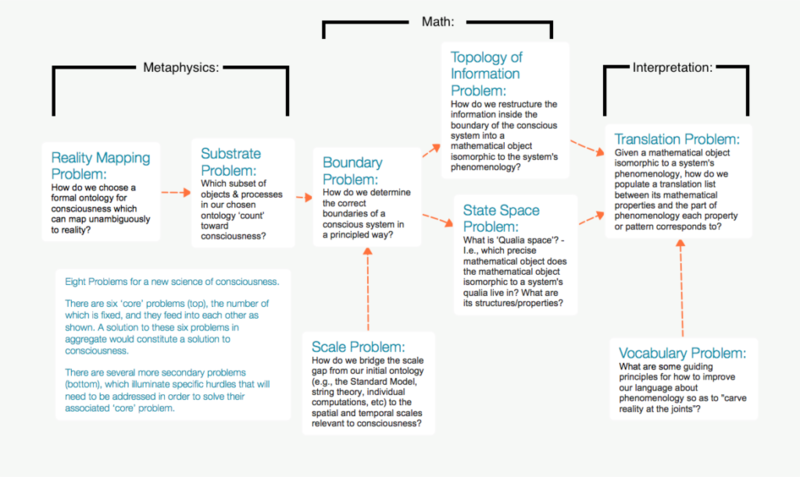 My “Eight Problems” framework is a blueprint for a “full-stack” science of consciousness & qualia. Addressing all eight problems is both necessary & sufficient for ‘solving’ consciousness. One of IIT’s core shortcomings is that it doesn’t give any guidance for what its output means. I offer some useful heuristics. 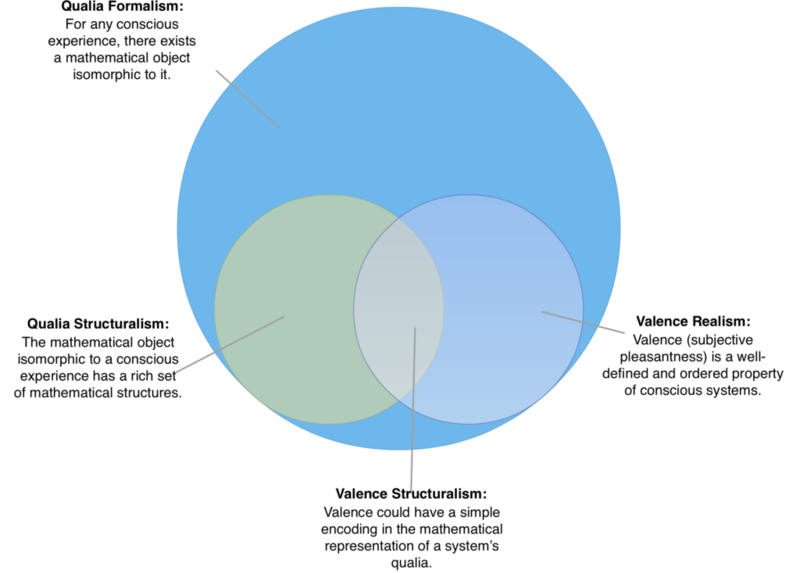 Affective neuroscience knows a lot about valence… but its knowledge is very haphazard, disorganized, and often circular. The techniques it uses are good at assembling data, but not so good at finding clear patterns in the data, or knowing what data to gather in the first place. It could be that there are no clean answers to be found, and this is the best we can do. But I don’t buy that- I think we’re just looking at it from the wrong level of abstraction. To really get traction on the problem of what makes some things feel better than others, we need to look for universal principles true in all conscious systems, not just things that are often true in the human brain. This also implies that any attempt to solve valence which tries to avoid addressing the larger mystery of consciousness simply won’t work. 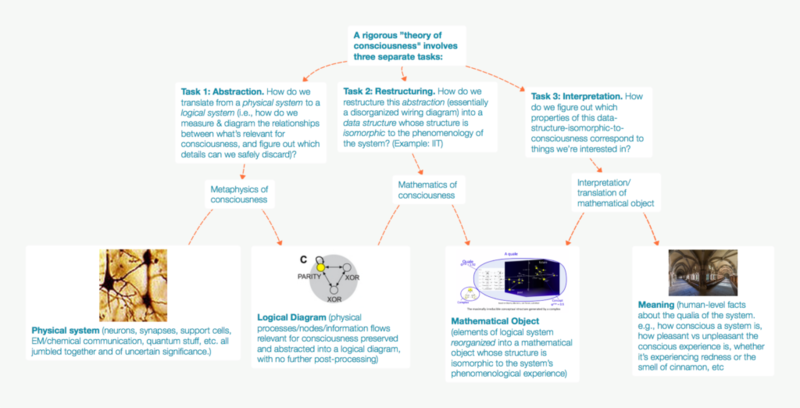 IIT is an attempt at a fully quantitative theory of consciousness. Think of it like a mathematical translation function: give it a system (like the brain), and it gives you a mathematical representation of what it feels like to be that system. It’s currently the best (and only) attempt at a full theory of consciousness we have. Unfortunately, the current iteration of IIT is probably wrong, and definitely incomplete. There are some problems with its math, it’s a little vague on what its input should be, and it says almost nothing about what its output means. Other people are trying to translate IIT’s math into the language of physics in order to fix these problems. Unfortunately, these attempts are mostly stuck at the ‘idea’ stage. If valence is some mathematical property of IIT’s output (or some future version of IIT which addresses its flaws), then what kind of property should we look for? Valence seems intuitively important rather than intuitively trivial: it’s hard to miss. Why this matters: if valence is [global,simple,atomic,intuitively important], then its mathematical representation is too. This significantly narrows the search space. There’s a lot of context in the paper that I can’t give justice to in this summary- but given a mathematical object isomorphic to a system’s qualia, I think I’ve identified the mathematical property which corresponds to its valence. This property is the object’s symmetry. (3) Similarly, consonant stimulation of the vagus nerve should feel better than stimulation with dissonant patterns (upshot: possibly testable with consumer-grade gear). Non-opioid painkillers and anti-depressants are complex, but it may turn out that a core mechanism by which they act is by introducing noise into neural activity and connectivity, respectively. This would explain the odd findings that acetaminophen blunts acute pleasure (Durso, Luttrell, and Way 2015), and that anti-depressants can induce long-term affective flattening. This would also predict that psychedelic substances, although often pleasurable, actually increase emotional variance by biasing the brain toward symmetrical structure, and could result in enhanced pain if this structure is then broken– i.e., they are in this sense the opposite of painkillers. Additionally, we may find that some uncomfortable sensations are caused by ‘competing symmetries’- patterns that are internally symmetrical but not symmetrical to each other, which would predict complex and sometimes destructive interactions between different normally-pleasurable activities and psychoactives. Furthermore, I would anticipate that severe tinnitus could lead to affective flattening for similar interference-based reasons: insofar as the brain’s subconscious preprocessing can’t tune it out, the presence of a constant pattern in consciousness would likely make it more difficult to generate symmetries (valence) on-the-fly. This would also imply that the specific frequency pattern of the perceived tinnitus sensation may matter more than is commonly assumed. My hypothesis implies that symmetry/harmony is a core component of the brain’s organizational & computational syntax: specifically, we should think of symmetry as one (of many) dynamic attractors in the brain. First, self-organizing systems such as the brain must develop some way to perform error-correction, measure & maintain homeostasis, and guide & constrain morphological development. Symmetry-as-a-dynamic-attractor is a profoundly powerful solution to all of these which could evolve in incrementally-useful forms, and so symmetry-seeking seems like a common, perhaps nigh-universal evolutionary path to take. Indeed, it might be exceedingly difficult to develop a system with complex adaptive traits without heavy reliance upon principles of symmetry. Second, the brain embodies principles of symmetry because it’s an efficient structure for modeling our world. (Lin and Tegmark 2016) note that physics and deep learning neural networks display cross-domain parallels such as “symmetry, locality, compositionality and polynomial log-probability”, and that deep learning can often avoid combinatorial explosion due to the fact that the physical world has lots of predictable symmetries, which enable unusually efficient neural network encoding schemes. Why do we find pure order & symmetry boring, and not particularly beautiful? I posit boredom is a very sophisticated “anti-wireheading” technology which prevents the symmetry/pleasure attractor basin from being too ‘sticky’, and may be activated by an especially low rate of Reward Prediction Errors (RPEs). Musical features which add mathematical variations or imperfections to the structure of music– e.g., syncopated rhythms (Witek et al. 2014), vocal burrs, etc– seem to make music more addictive and allows us to find long-term pleasure in listening to it, by hacking the mechanic(s) by which the brain implements boredom. I’ve used valence as a ‘pilot project’, but ultimately, the goal is to build a full Science of Qualia — something that can turn qualia research from alchemy into chemistry, and unify our different modes of knowing in neuroscience. If this intrigues you, I suggest checking out the full paper.